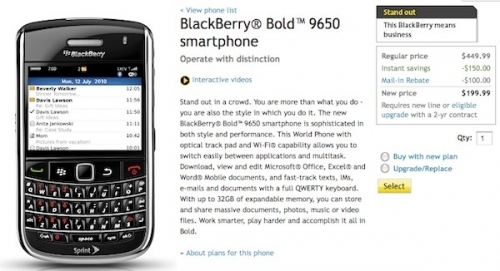 BlackBerry Bold 9650 finally available at Sprint | BlackBerry Blast! Sprint BlackBerry users are in luck. The BlackBerry Bold 9650 went on sale a little early and is now available online. The launch was expected to be May 23rd, but it looks like Sprint released it a little early. You can pick up your BlackBerry Bold 9650 for $199 after a $100 mail-in rebate. You'll of course have to sign a 2-year agreement. If you prefer to purchase the phone outright you'll have to shell out $449.99.